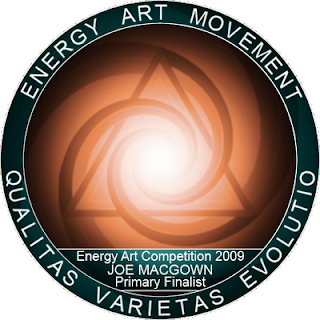 I just found out that I was a primary finalist in the international online Energy Art Salon Competition 2009! As a result of this, my entry "Zabulation" with be included in the annual Energy Art Salon Exhibition at Murphy Hill Gallery located on the third floor of the historic Sears & Roebuck Bldg. at 3333 W Arthington St. Chicago, Illinois 60624, USA (http://www.murphyhillgallery.com/ ). The exhibition will run from Jan. 15 - Feb. 25, 2010. Things have been busy this summer - both at work and at home! Although I have been busy, I have also had time to be involved with some group exhibits. I had my painting "Ossiforestation" in the 18th Annual People's Choice Art Competition at the Meridian Museum of Art (MS). The show ran from 6 June through 11 July. I have a watercolor painting of a zebra swallowtail butterfly on display as part of a group exhibition at Greater Starkville Development Foundation Gallery, 200 Main Street, Starkville, MS. I also have prints of some of my weird drawings at the Creative Warehouse in downtown Starkville. Anyone interested should stop by and buy a print! 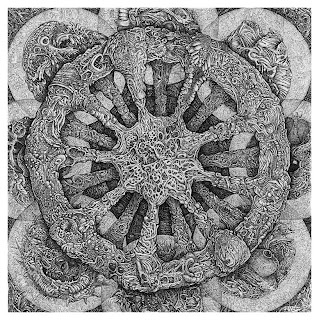 I have my drawing "Echinodermatter" in a really cool group show at the Sunrise Gallery in Hamilton, Ontario, CANADA. 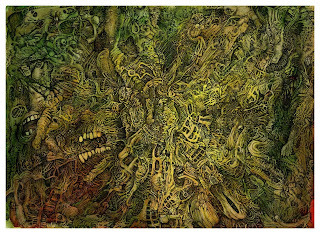 The show, featuring international artists from the Energy Art Movement is entitled "Green Energy" runs from 11 July through 2 August, 2009. The show includes such notable artists as De Es Schwrtberger, Robert Venosa, Martina Hoffman, Giorgio Vaselli, and others. This same drawing will be included in an upcoming book including the works of 100 international artists. 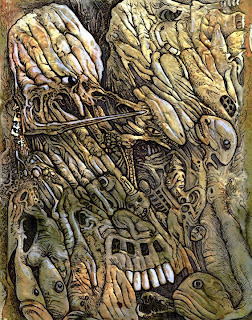 The book includes works of some of the members of the Surreal Arts and the International Imaginative Artist Association (IIAA), both hosted on Deviantart.com, and will be published by nEgoist publishing. This surrealist book collective will be entitled: Imagine the Imagination, New Visions of Surrealism. I was featured as the daily artist on "The Daily Art Fixx", on May 8, 2009! This web site features and writes about a different artist everyday. 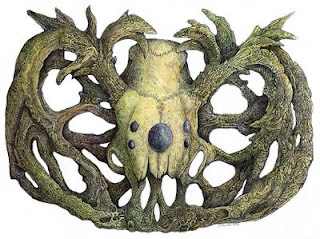 Very cool You can check my feature out at "Semi-Strange Art: Joe MacGown". 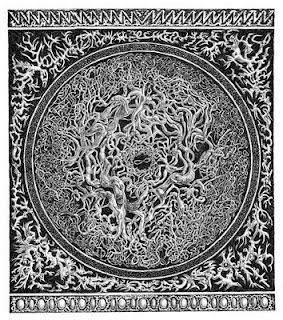 A couple of weeks ago I was interviewed by a new surreal collaborative group called the Collaborative Corpse. You can read the interview here: "Interview with club member Joe MacGown". My one man show at the Bly Fine Arts Center in Eupora, MS is now officially over. Overall, I thought the reception went well, and we had around 150 people show up! If the consumption of the vast quantities of food we had on hand was any indication, the event was a great success. Check out my page for more pictures and info on the show at MACGOWN - EUPORA ART EXHIBIT. Thanks for everybody who was able to make it to the opening and to others who saw the show later! Only a few more days until my one man show opens at the Bly Fine Arts Center in Eupora, MS from 25 April to 2 May 2009! The reception will be on 25 April from 6 to 8 PM. Everything is framed and hanging. A print of my drawing "Infinity" is matted and framed and will be given away in a random drawing. The frame alone is worth a good bit, so come on out and maybe you will leave with a cool print! The Cotton District Arts Festival was held last Saturday 18 April 2009 in the Cotton District in Starkville, MS. This festival has grown and now is considered to be one of the major festivals of its type in the Southeast. Lots of music, art, good food, a 5K race, and much more. It was highlighted by the juried arts show, which was judged by Sanders McNeal from Jackson, MS. I had my piece entitled "Zabulation" accepted, and my wife Julie had a photograph entitled "Forgotten Moments" accepted. Zabulation won first place in the drawing and painting division!! The landscape show (of which I have two pieces in) at the Greater Starkville Development Office at 200 Main Street in Starkville, MS will remain up for two more weeks. If you happen to be in downtown Starkville, stop by and view the wonderful artwork. It often surprises me how many talented artists we have in our community. Two weeks to my one man show opens at the Bly Fine Arts Center in Eupora, MS from 25 April to 2 May 2009! The reception will be on 25 April from 6 to 8 PM. I have everything framed and ready to go. I also have some prints that I am planning on bringing by to sell, if anyone is interested. A print of my drawing "Infinity" is matted and framed and will be given away in a random drawing. The frame alone is worth a good bit, so come on out and maybe you will leave with a cool print! The Cotton District Arts Festival will be held this coming Saturday 18 April 2009 in the Cotton District in Starkville, MS. This festival has grown and now is considered to be one of the major festivals of its type in the Southeast. Lots of music, art, good food, a 5K race, and much more. It is highlighted by the juried arts show, which will be judged by P. Sanders McNeal from Jackson, MS. I had my piece entitled "Zabulation" accepted, and my wife Julie had a photograph entitled "Forgotten Moments" accepted. I just received news that the two pieces I submitted to the 36th annual Meridian Bi-State Art Competition at the Meridian Museum of Art (MS) were both accepted! This is a great show, and I was happy to hear they were accepted. Unfortunately, although my art will be on display during the duration of the show from March 14 - April 18, 2009, my art will not be judged for the best of show purchase award because the two pieces I entered are priced much higher than the amount of the purchase award. In not agreeing to sell the art in case it was to win, I forfeited the right to be included in the judging. It was a difficult decision, and I probably would have entered something different had I known about this in advance. Nevertheless, it is a great show and lots of people will be attending the opening. I will have two landscapes on display in a group show at the Greater Starkville Development Foundation Gallery from 2 March through 1 May 2009. One of the paintings is an acrylic landscape called "A Cloudy Day in Sessums", and the other painting is a watercolor entitled "Tree in Winter". I am still trying to get ready for my upcoming one man exhibition at the Fine Arts Center in Eupora, MS from 25 April to 2 May 2009. I also need to start thinking more about the reception on 25 April from 6 to 8 PM. Lots to do! Come to the show if you can! I had three of my drawings published recently in an art and poetry book entitled "Harvests of New Millennium", which is published in India. The three pieces are "Infinity" , "Self Searching 5" , and "Facing the Future" . The book is a paperback on glossy paper, but is not as good quality as I had hoped. However, the artwork in it is wonderful, and I can tell you that I don't mind having art in the same book as Peter Gric and other comparably talented artists! I am submitting three pieces to the Cotton District Arts Festival Juried Competition held in Starkville, MS on 18 April. I have had good luck in this show the last three years having won 3rd, 1st, and 2nd overall. This show has grown by leaps and bounds and now it has become a regional event. It has been named one of the 2009 top 20 events in the Southeast by the Southeast Tourism Society. Of course, that means getting artwork accepted is much harder and means a lot more. Wish me luck. I will also be judging the High School Juried Art Show for the festival, which should prove challenging. In other interesting news, I am on the senior thesis committee for an art student in the Mississippi State University Art Department. Although I am not associated with the art department in any way, both the student and his advising professor are apparently fans of my art work and wanted me on the committee. After two meetings so far, I am finding the experience to be quite rewarding, and hopefully my input has some meaning! My next show will be a one man exhibition at the Fine Arts Center in Eupora, MS. The show will be from 25 April to 2 May 2009 with an opening reception on 25 April from 6 to 8 PM. I plan on having at least 40 framed drawings in the show, and maybe more depending on what I can fit in. I will also have some prints for sale. 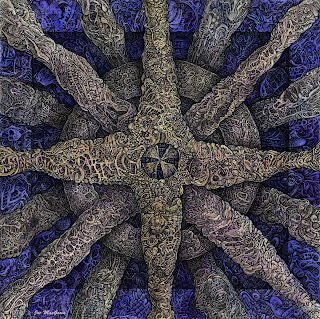 I plan on giving away a framed print of "Infinity" (see the picture above) in a random drawing. I hope to get lots of people from Starkville to make it to the show, as Eupora is a small town. However, they do have a gallery, so that is definitely a step in the right direction! In other news, I just found out I will be one of the featured artists at an event at Mississippi State University called "Mississippi's Best Grassroots Concert." The event is from 6 to 9 PM on 10 February 2009 at Lee Hall on the MSU campus, and it is free. Various artists in the region will have several pieces of their artwork on display for that time period with the first hour devoted to viewing the art, and the remaining two hours will be filled with some of the best music from north MS. The music will include a variety of genres having origins in our region including blues, bluegrass, jazz, gospel, and other styles. My 2-man show with Cetin Oguz at the Meridian Museum of Art is up for two more weeks. The opening on January 3 went well, especially considering the fact that it was raining like crazy! I was fortunate to have a nice contingent of people from my home town of Starkville make the trip to Meridian just to see the show. Thanks guys! The response from viewers was great, and I had tons of questions asked. Additionally, both Cetin and I gave a short talk about our art with a questions and answers session. Although, I did not list prices on my work at this show, I still managed to make a nice sale of my drawing "In the Beginning"! 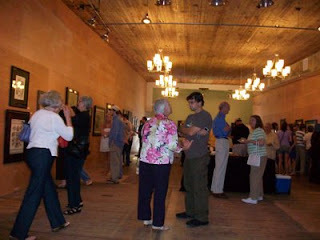 I met some wonderful people at the show who showed great interest in my art, and all and all it was a wonderful event. For more info and some photos of the show go to my web page about the show (link). I had a couple of wonderful write-ups about me and my art in the Columbus Dispatch and Starkville Daily news. The Starkville paper was especially nice because I was on the front page in full color! Very cool. In other news, I donated a framed print to our local arts council fund-raiser auction (the Starkville Area Arts Council) where we raised over $10,000! The awareness of the arts in our relatively small town has really increased in recent years. I also have some prints on display and for sale at the Creative Warehouse in Starkville (MS). If you are in town, check them out! This week I framed two drawings and am finishing another that I still need to frame for an upcoming International Imaginative Arts Association (IIAA) group show in Los Angeles that should be opening hopefully sometime in the spring. I have a big one man show coming up in late March at the Fine Arts Center in downtown Eupora, MS. This is a small MS town, but yet another one focusing on the arts. I was able to get a grant from the Mississippi Endowment of the Arts to help pay for framing for this show. I hope to have a good crowd on hand and in addition to the original artwork, I will have prints for sale. I hope to enter at least one, and maybe two new works in the upcoming Cotton District Arts Festival juried show in April. This is a wonderful event with many great artists from the Southeast competing for cash prizes. The last three years have been good for me there as I have placed 3rd, 1st, and 2nd overall during that span! I also plan on entering two pieces in the Meridian Museum of Art Bi-State Juried Competition this spring.